The background given in our previous two posts on the Jewish Feast of Sukkot (Tabernacles) has set the stage for the story of Jesus that we now turn to in John 7. Remember that this feast, ordained by God in Leviticus, is in the fall and is one of the three that every Jewish male is required to attend. It celebrates not only God taking care of the Israelites during their forty year wandering, but also celebrates the fall harvest. A half a million people or more (Josephus says two million) crowded into Jerusalem for this important holiday. Every morning for seven days, starting at daybreak, people would try to secure their spot to watch the upcoming daily ceremonies in the Temple Courts. Well before the 9:00AM ceremonies would begin, the Temple grounds would be completely full of worshipers. At 9:00AM, the shofar blew to announce the beginning of the day’s ceremonies. The service began at the steps in the Women’s Courts, in front of the Nicanor Gates. The crowd would begin by chanting Psalm 113-118, called the Hallel. The Levitical choir would be up on top of the steps where everyone could see and hear their voices. There was no silence in Jewish Temple worship – they were loud and passionate! Rabbinic sources say you could hear the crowd from Bethlehem, several miles away. Spontaneously, the crowd would chant almost continuously from 9:00AM to 3:00PM, while various ceremonies were undertaken. Every day for seven days there was a special ceremony performed just before the 3:00PM sacrifices, called the “Water Drawing Ceremony”. This ceremony had its origins in 1 Samuel 7:2-6 where Samuel poured out water on the ground and asked God to forgive and save the Jewish people. The ceremony also drew off Isaiah 12:2-6, where it says, “with joy, draw water from the well of salvation”, and Zechariah 14:8-11 that says, “on that day, living water will flow out from Jerusalem (which referred to the Messiah). Let’s take a look at what took place in the water drawing ceremony. Just before 3:00PM, a shofar would blow to announce the start of the ceremony and the crowd would begin chanting the Hallel. When they got to Psalm 118:25, they would chant it over and over. The high priest would come out of the Temple and go down the steps to the water gate. He would be carrying a large golden ceremonial pitcher. Fighting his way through the crowd, the priest would proceed to the Eastern Gate and exit the temple grounds. Then he would turn right, down the Kidron Valley, to the Pool of Siloam that contains water from the Spring of Gihon, Jerusalem’s water source. The priest would then dip the golden pitcher into the water and take the full pitcher back up the hill to the Temple. When the crowd spotted the priest coming with the pitcher of water, they would begin to chant even louder and with more fervor. “Save us, Save us, Save us” they would say, over and over. As the priest approached the altar, the shofar again would sound. The priest would climb the ramp of the altar and pour the living water before the Lord. When the pitcher was empty, the priest would hold the empty pitcher high in the air to the roar of the crowd. The huge menorahs in the Temple were then lit and the worshipers filed out of the Temple and the services were over for the day. The water drawing ceremony was done every day of the Feast, but on the last and greatest day called Hoshanah Rabbah, the ceremony was a little different. When the priest arrived with the golden pitcher and climbed the altar, the crowd would be ecstatic. Slowly, the priest would walk around the altar seven times, carrying the pitcher full of water (this was probably done to repeat what had happened at Jericho, with the promise of the Promised Land). Seven times the priest would hold up the pitcher and on the seventh time, the shofar would sound and the crowd would go deathly quiet in anticipation of him pouring out the pitcher of living water on the altar. Doesn’t knowing about the Sukkot Festival and the Water Drawing Ceremony make this passage of Scripture in John mean so much more? We can draw at least two faith lessons from this interesting story. First, we can learn something from the Jewish people about being able to celebrate and rejoice. We are so reserved, so stoic in our approach to God. There is a time and place to be ecstatic in our love for God! Secondly, the whole theme of the Feast of Sukkot was to petition God to ask Him to send the living water (rain) and to forgive us of our sins, so that we can prosper. After Pentecost, we are the Temple of the Holy Spirit and as the prophecy proclaims, living water will flow from us to other people. God give us a taste of Sukkot, so that we may be Sukkot to others in this dry and thirsty world! In our first lesson on the Biblical Feast of Sukkot, we looked at how God instructed the Israelites to observe this holiday that He ordained. Also, we looked at when and how it is celebrated today by Jews all over the world. In today’s post we will look at how the Feast of Sukkot played into Jewish history. Over the years, three historical events added a lot of emphasis and meaning to the Jewish perception of the Feast of Sukkot. These three events gave a strong national identity to Sukkot and gave the Israelites a special sense of pride and fervor each time it was celebrated. God had come to permanently tabernacle (dwell) with His people. On the second day of the month, the heads of all the families, along with the priests and the Levites, gathered around Ezra the teacher to give attention to the words of the Law. They found written in the Law, which the Lord had commanded through Moses, that the Israelites were to live in temporary shelters during the festival of the seventh month and that they should proclaim this word and spread it throughout their towns and in Jerusalem: “Go out into the hill country and bring back branches from olive and wild olive trees, and from myrtles, palms and shade trees, to make temporary shelters”—as it is written. So the people went out and brought back branches and built themselves temporary shelters on their own roofs, in their courtyards, in the courts of the house of God and in the square by the Water Gate and the one by the Gate of Ephraim. The whole company that had returned from exile built temporary shelters and lived in them. From the days of Joshua son of Nun until that day, the Israelites had not celebrated it like this. And their joy was very great. From the Text we know that their joy was very great and from this point on the Feast took on an even more important place in Jewish hearts. God had let them reestablish their identity that was so powerful during the time of Solomon. The third historical event occurred between the time of the two testaments, during the Macabbean revolt. Under the thumb of the Greeks and not allowed to use their temple, circumcise their boys, or even own a copy of Torah, the Jews finally revolted to overthrow the Greeks. This revolt lasted seven years and when they were finally victorious, their leader, Judah Macabee, ordered an eight day celebration to commemorate the fact that they had missed the Feast of Sukkot during the revolt. This holiday is known today as Hanukkah, or the Festival of Lights, and celebrates God giving His people their temple back and once again establishing them as a free nation. These three events, taking place over one thousand years, added a lot of tradition and importance to the Sukkot Festival and it became much like the American Independence Day celebration held annually on the 4th of July. 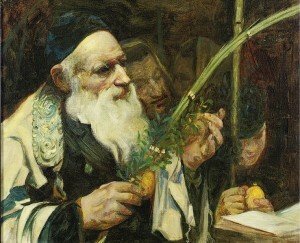 A fourth event that developed over the years – not as a direct order from God, but as a tradition – was the waving of the “lulav”. God told the returning Israelites in Nehemiah 8:13-18, to put the branches of three types of trees (palm, myrtle, olive) on the roofs of their booths. The tradition developed over the years of wrapping the olive and myrtle branches around a large palm frond to make a long standard or flagpole of sorts. During the Feast of Sukkot, every worshiper at the temple waved these “flags” around much like Americans do on July 4th. On the last day of the Feast, the worshipers were supposed to beat the ground with the branches until all the leaves came off – with lots of noise and intensity, like American fireworks. Can you imagine the noise and commotion that half a million or more people would make following this procedure? While waving and beating the “lulavs”, the assembled worshipers would chant Psalm 113-118, called the “Hallel”. A look at these Psalms shows you that they say everything that is great and awesome about God. The word, “Hallel”, translated in English as “praise”, is a middle eastern word. It’s root is a sound that middle eastern women make in extreme emotion – a shrieking, rolling of the tongue. When you hear them do it on television, it is a sound you don’t forget. Hallel to God is Hallel Yhwh, or as we say, Hallelujah. However, they don’t say it like we do; it comes out with great emotion: Hallel to Yhwh! If your look at Psalm 113 it begins with Hallel-u-Yah – or “Praise the Lord”. The crowd would continue chanting through each psalm with emotion and voices rising and coming to a climax when they got to Psalm 118:25. This verse was the key verse and heart of the Hallel. “O Lord, save us, deliver us, save us! O lord grant us success, or make us fruitful, make us worthwhile, make us significant!” By the way, “save us” did not mean “salvation”, but had to do with a call for rain; as in “send us rain”. It’s interesting to note that rain and salvation are always connected because rain is so life-giving and necessary for survival. Picture hundreds of thousands of Jews, waving the lulavs, and shouting the Hallel in a shrieking, emotional voice. All of this historical background sets the stage for an awesome New Testament Story that happened during Sukkot. That will be the topic of our next post on this fascinating subject.